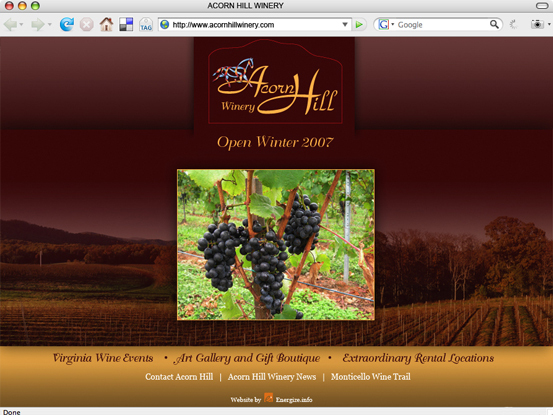 Acorn Hill Winery, Splash Page — PRK Kreative Portfolio | Responsible web site design, development, and marketing. Acorn Hill Winery approached Energize.info to design a splash page in preparation for their official web site launch in the fall of 2007. Working with Energize.info we designed a splash page to introduce the brand to the public and integrated our email list management engine to allow people to sign-up for their announcement list. We have worked with over 89 clients since our humble beginnings in 2002. Please view our complete client list or contact us to request references.